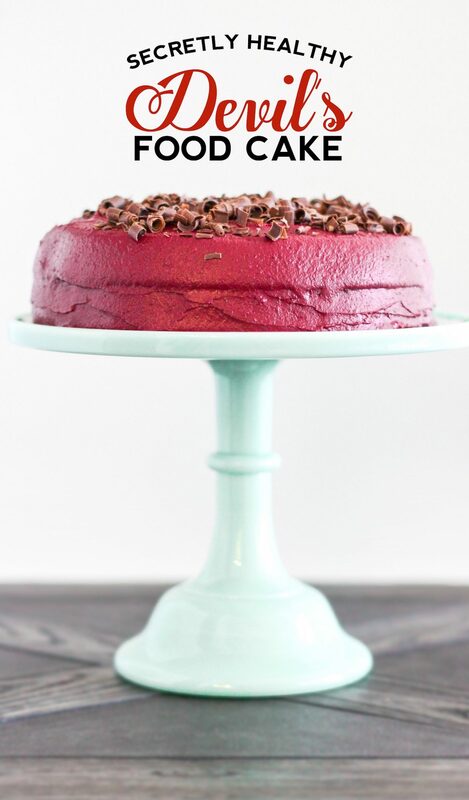 Healthy Devil’s Food Cake with a Red Velvet Frosting — a moist, yet airy, chocolate cake topped a devilish, naturally red frosting. 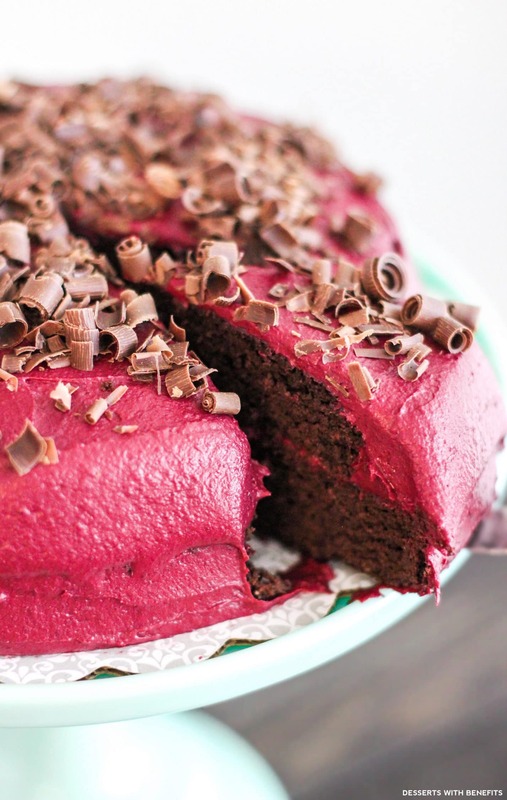 Devil’s Food Cake is supposed to have a slight reddish tint. That wasn’t really a main concern for me since I knew it was going to be coated in frosting and so many modern Devil’s Food Cakes are just brown (plus, I care more about overall flavor and texture). 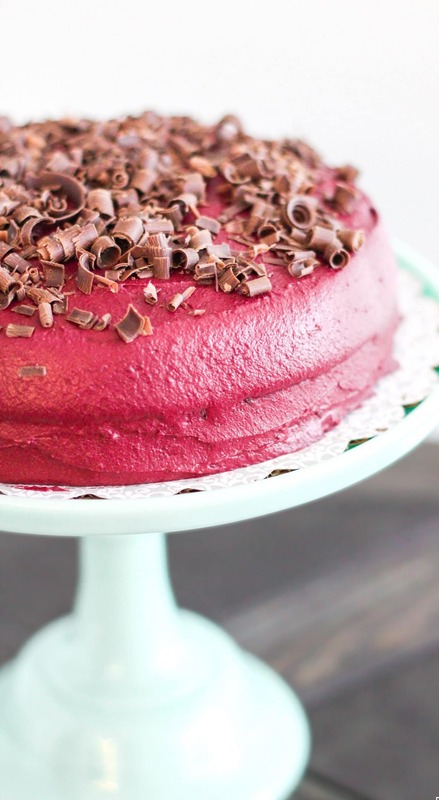 Surprisingly, this cake DOES have a hint of red color! How excitingggg. Red Velvet is a difficult flavor to encapsulate since it’s not exactly chocolate, but it’s not vanilla either. It’s supposed to have just a hint of chocolate. Thankfully, this frosting is sweet, buttery, vanilla-y and chocolatey! Weeee. And don’t worry, you don’t taste the secret ingredient, hehehe. But what tops the cake? Literally, grated chocolate. But, figuratively, the fact that this recipe is totally healthy. No butter, no oil, no white flour, no white sugar, and no artificial food dyes. This Devil’s Food Cake may be healthy, sugar free, low carb, high protein, paleo, and gluten free, but it tastes like PURE. SIN. Ohhh mahhh gaahhhd give me the entire thing! 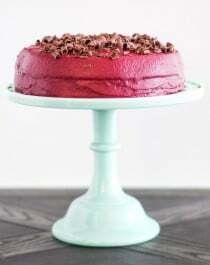 Moist and fluffy Gluten Free Devil's Food Cake recipe with an all natural Red Velvet Frosting! Secretly sugar free, low carb, high protein, and paleo too! Preheat the oven to 350 degrees Fahrenheit. Spray two 8” cake pans with cooking spray and line with parchment paper circles. In a medium-sized bowl, whisk together the coconut flour, cocoa powder, erythritol, baking powder, baking soda and salt. In an electric stand mixer bowl fitted with a beater attachment, add the eggs, applesauce, almond milk, coffee, vanilla extract, butter flavor and stevia extract. Mix on low speed. Dump the dry ingredients into the stand mixer and mix until the ingredients are fully incorporated. Scrape down the sides of the bowl if necessary. Pour the batter into the prepared cake pans. Tap the pan on the counter a few times to make sure it’s level. Bake for ~50 minutes, or until the surface springs back when tapped. Let cool in the pan. Rinse and gently scrub 2 medium beets, then individually wrap them in foil. Place the beets on a jelly roll pan and bake for 1 hour, or until a fork pierces through the center of the beets with ease. Carefully unwrap the beets and let cool for 30 minutes. Scrape off the beet skins (they should peel off easily) and chop into chunks. Add the beet chunks to a blender and purée until completely smooth. While blending, add the coconut milk, vanilla paste, butter flavor and powdered erythritol. Pour the mixture into a bowl (scrape out as much as you can! ), then stir in the protein powder until thickened. Frost the cake, slice and enjoy! 270 calories for a slice of cake AND frosting?! FOR REAL?! Not only that, but it’s got 7g of healthy fats, 12g of filling fiber, and 25g of satiating protein. Oh yes. Watch me make this cake with TheFeedFeed when I took over their SnapChat! i cannot believe that one slice is only 270 cals! 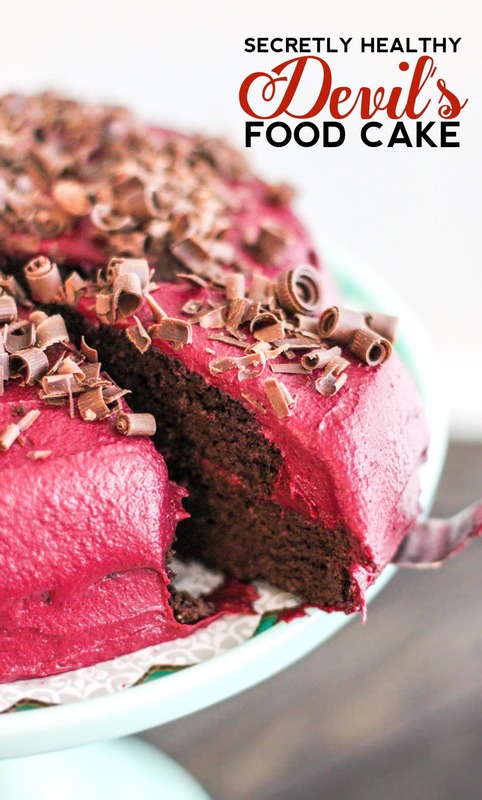 this looks so decadent and delicious, no one will know it’s healthy!! Nice addition of the coffee to the cake batter! I think that’d add a deeper flavor. And I was guessing it would be beets that contributed to the red color, I was right! So pretty! Jessica, You and your website are beautiful and look delicious, but I wish I could see a photo of the recipes in the email updates. Is there any way to include a photo in the emails? As for the granulated sweetener –> stevia replacement, it really depends on the recipe. Most often, though, the combo of erythritol + stevia makes for a “real-sugar-tasting” dessert. Stevia alone might make the cake taste a little off. I don’t really recommend using 100% stevia in my recipes unless I made it that way… I just don’t want you to expect a really yummy dessert and have it flop from a substitution. All I know is that in cookies, the granulated sweetener is necessary for the texture and flavor. In frostings, the powdered erythritol is necessary for the texture and flavor. Red Velvet. Frosting. YOUVE GOTTA BE KIDDING ME!!! You are my hero haha! 🙂 and thank you!! And thank you for posting something on how to make beet puree. I’ve been craving red velvet after prepping for a competition and wanted to “indulge” without eating 3000 calories in one sitting haha! I basically just went through your entire blog. I’ve followed you for a while. Thanks for this recipe I’m making it for my 23rd bday!! Can you substitute another type of protein powder? I have regular whey chocolate protein powder and I’d rather not buy the rice one! Excited to try this out for Easter! Ok, next question! I thought I could find natural butter flavor in a store, no luck. Now it’s too late to order any online and get it in time. Can I leave it out? Throw in some regular butter instead? Help!